WITH THE HORRIFIC MASSACRE of at least 50 Muslims in two mosques in Christchurch, New Zealand, the world is once again shaken by white supremacist mass violence. Many of the victims were refugees and migrants, targeted specifically because the killer saw them as outsiders in the white Christian settler society he claimed to be protecting. This attack in Aotearoa (the indigenous name of New Zealand) is heartbreakingly familiar to all communities targeted by white supremacy, but it is also a specific product of the normalization of anti-Muslim hate throughout the Western world. The killer cited both Donald Trump and other white supremacist shooters as his inspiration. In the aftermath of the shooting, politicians like Australian Senator Fraser Anning have simultaneously condemned the killer while normalizing his Islamophobic animus as a reasonable concern. Trump himself seems more upset about Fox News’s suspension of Judge Jeanine Pirro over her Islamophobic comments than he is about the mass murder of Muslims. Meanwhile, Muslims are forced to grapple with the fact that the militarized police sent to protect their most sacred spaces are part of the same surveillance state that targets them on a daily basis. And many of the governments now sending their condolences are also responsible for the wars and the humanitarian and ecological crises that forced people to flee their homelands in the first place. 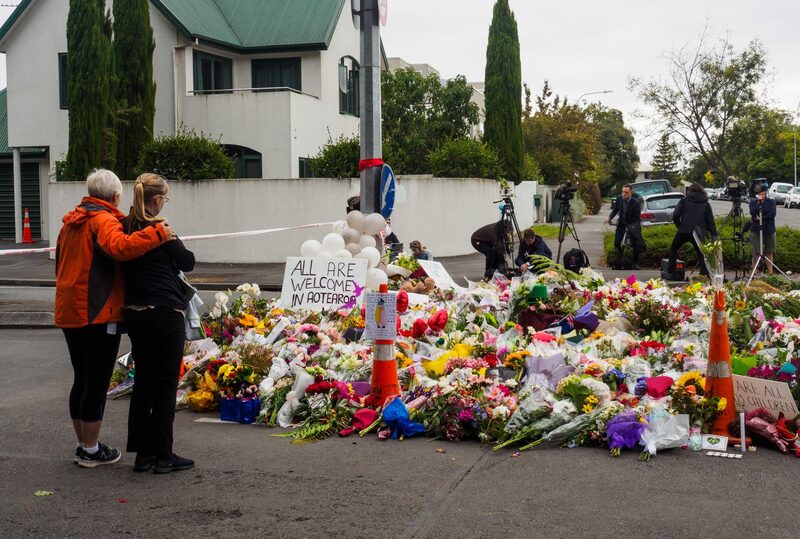 As American Jews show solidarity with the Muslims of Christchurch and share in their pain, we must grapple with the ways some who presume to speak for us have enabled this violence. Many members of our community have vocally supported America’s wars in the Muslim world, or aligned themselves with politicians and organizations that claim to protect Jews while defaming Muslims. Many have stood by Israel even as Benjamin Netanyahu welcomes the Kahanist movement into his coalition—the group responsible for the 1994 massacre at the Ibrahimi mosque in Hebron—and despite the inhuman siege of Gaza and the daily humiliations of Palestinians in the occupied West Bank. We must speak out against the day-to-day incitement that is far too often carried out in our name. As Jews, we must understand white supremacists as an enemy we share in common with Muslims. We know what it means to be attacked while praying. In recent memory, white supremacist violence has targeted mosques, synagogues, Sikh gurdwaras and Black churches in the US and around the world. There is a reason the hateful choose such an intimate and harrowing form of violence. These are violations not only of innocent lives but of the oneness of all things experienced in the act of worship. For many people, places of worship are the most important sources of community and comfort that exist outside the home. The message to the communities victimized by these attacks is that they will never be free, they will never be safe, and they will never be accepted by society. It is a way of enforcing artificial lines of division, conquering the difference that so threatens the white supremacist worldview. But religious spaces aren’t just vulnerable targets; they are also sites of resistance. The Emanuel African Methodist Episcopal Church attacked in the 2015 Charleston shooting was founded in the 1810s in resistance to anti-Black racism of the city’s churches. It is part of the AME denomination, created to provide a spiritual home for free Black people and slaves seeking a faith community outside white Christian hegemony. Similarly, the Tree of Life Synagogue in Pittsburgh was targeted due to its work with HIAS, an organization first formed to bring Jewish refugees to the US that now serves displaced people of all faiths. The killer in Pittsburgh espoused far-right conspiracy theories that treat Jews as outsiders seeking to destabilize white America. These sacred places where we are most vulnerable are also where we are strongest. When our faith communities come under attack, we can resist this violence by holding on to the principles they teach us. In Christchurch, as in Charleston, the shooter was greeted with words of welcome before he began his attack. The community he sought to violate was one that reflexively welcomed the stranger. All that is left to do in the face of such brutality is to remain open and loving as we commit to protecting each other. We must refuse the call of fear and hate, while also refusing complacency in the face of terror, incitement, racist policies, imperialism, and all the other systems upholding Islamophobia and white supremacy. We cannot bring back the lives lost to the horrors of white supremacist violence, but we can, and in fact we must, make the fight against it a daily practice, for the sake of our neighbors as well as ourselves. Rebecca Pierce is a Black and Jewish filmmaker, writer, and activist.